Instant Deviated Septum Relief Soft Nasal Aid Gently Opens Airway | Max-Air Nose Cones ® | Sinus Cones ® Official Site - ultimate breathing | snoring relief for the sleep of your dreams. Seeking an easy treatment for breathing difficulties due to a deviated septum without surgery? If you have a deviated septum, which is defined as a curve or deviation to the normally straight nasal septum (the cartilage that is in the center of your nose and which separates the nasal airways from one another), most likely you have difficulty breathing through one nasal airway or the other. This breathing difficulty can make you feel unbalanced when you inhale; and during sleep, a deviated septum can make it difficult to sleep on your side. A deviated nasal septum is especially problematic at night, because it obstructs nasal airflow through one or both nasal airways, which disrupts sleep. If you are looking for simply the best choice in nasal airway relief for breathing difficulties due to a deviated septum so that you may breathe better while you sleep, new Max-Air Nose Cones may be just the solution that you need. Max-Air Nose Cones are squeezie-soft internal nasal dilators that gently stent open the nasal airway so that the breathing restrictions of your deviated septum are eliminated without surgery or pain. Inhale fully, deeply and effortlessly for easier breathing and deeper sleep. A comfortable treatment for a deviated septum without surgery, Max-Air Nose Cones gently support the entire nasal at multiple points of contact. By doing so, they effectively create an open-air pathway to by-pass the airflow obstruction of a deviated septum. Although a deviated septum may not be very visible on the outside of the nose, it can be highly troubling inside the nose; restricting nasal airflow and breathing volume to one or both nostrils. Max-Air Nose Cones not only maximize nasal airway relief, they are ultra-soft, simple-to-use and engineered for comfort and fit. 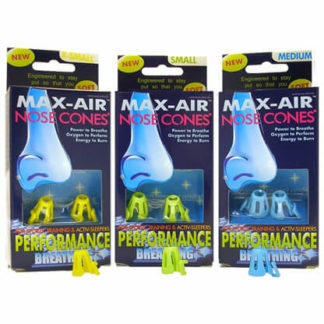 Made from specially selected FDA-certified medical material (latex-free and hypoallergenic), Max-Air Nose Cones are squeezie-soft, have side holes to make them lightweight for barely noticeable wear, yet are durable and resilient enough to bypass the nasal obstruction and allow maximum breathing relief. 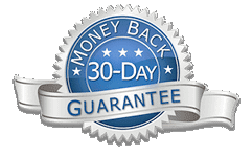 You have a wonderful product that, even after two septoplasty surgeries, has drastically reduced my sleep apnea. * Robert P.
A look inside the nose. What does a deviated septum look like? 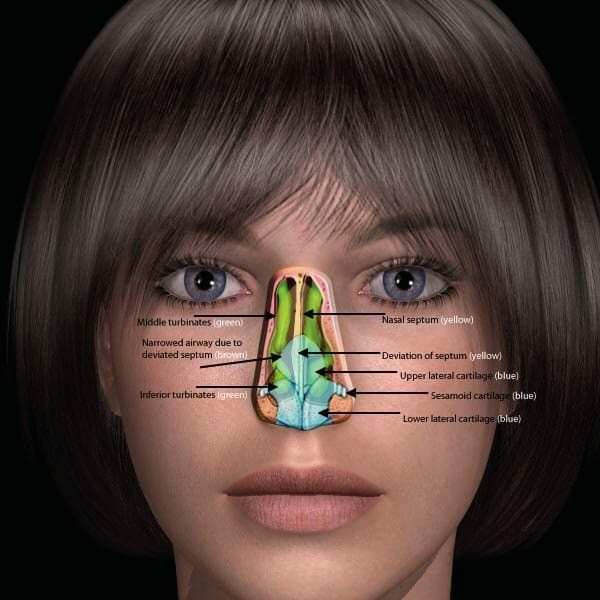 Here is an anatomically correct illustration of a deviated septum (shown in yellow). Max-Air Nose Cones simply, through gentle pressure, hold open narrowed airways to help restore full, deep nasal breathing (without surgical intervention), so that you may breathe well and sleep well. A deviated septum is an abnormal curvature or “deviation” in the nasal septum. As shown above, when the septum is deviated it narrows one of the nasal airways and limits airflow. The Max-Air Nose Cones are specifically suited to relieve the blocked, stuffy-nose feeling that is caused be a deviated septum. What are the top 7 symptoms of a deviated septum? THE PRIMARY SYMPTOM OF A DEVIATED SEPTUM IS DIFFICULTY INHALING THROUGH ONE NOSTRIL OR NASAL AIRWAY, WITH NO APPARENT NASAL CONGESTION. With its immediate stenting action (you will feel the rush of airflow immediately and hear a clear difference when inhaling), the Max-Air Nose Cones hold the airway open, even when sleeping to one side or the other. Start breathing more easily so that you may get to sleep faster, anytime that you choose. What can be done to relieve a deviated septum? Nose Cones work at the source of the airway problem, inside the nasal passageways. Depending on the severity of the deviation, surgery may helpful in correcting the deviation. An Otolaryngologist (Ear, Nose & Throat Surgeon) will perform a septoplasty to straighten the nasal septum. For more information visit the American Academy of Otolaryngology website. For milder cases of deviated septum of if you choose not to have the surgery, the “squeezie-soft” Max-Air Nose Cones may offer a simple solution in deviated septum. Super soft (like a contact lens), Max-Air Nose Cones bypass nasal obstruction from a deviated septum by gently stenting an open-air pathway around the deviated septum, so that you may inhale freely and deeply with your nose. How can I tell if the new Max-Air Nose Cones will work for my deviated septum? There is an easy way to tell if the Max-Air Nose Cones will work for you. It is called the “Cottle Maneuver”. Simply block one nostril with your thumb. Then gently take hold of the other nostril and manually dilate it by gently pulling it open laterally towards the cheek. Inhale normally through the manually dilated nostril. Repeat maneuver with the other side. Do you feel an improvement in airflow? If there is a feeling of improvement on one or both sides the Max-Air Nose Cones may be just the solution that you seek. If there is no improvement, chances are that your obstruction is more complicated and it is advised that you seek attention from an Ear, Nose & Throat surgeon. How the new Max-Air Nose Cones work to relieve a deviated septum. Nasal septal deviations can restrict airflow to one or both nostrils. The gentle pressure of Max-Air Nose Cones opens the deviated septum airway restriction, improves airflow and makes breathing easier, more symmetric and comfortable. Often noses with a deviated septum have varying size nasal passages. The Cones are easy to customize for this issue. Simply purchase two sizes. Size one side according to the direction on our sizing guide, and then order a smaller size of the Max-Air Nose Cones for the problematic deviated septum side. Some deviated septum noses only have problems and need help in one nostril. The Nose Cones may be separated and worn individually to combat this very prevalent condition. My wife and I have never slept better. I have been a sufferer of a deviated septum and allergies for years now. Consequently, I snore heavily which prevents me, and my wife, from getting a restful night’s sleep. Your Nose Cones have given me instant relief and allowed me to breathe freely without any discomfort. I am sleeping more soundly and therefore I have regained a tremendous amount of energy during the day. * – Tom B.